One of the island's major and most popular deluxe hotels. 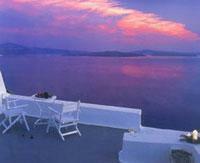 Located at Oia, at the northwestern part of the island, it offers a breathtaking view to the Volcano and the sunset. Its full set of facilities will satisfy even the most demanding client and will definitely offer you an unforgettable stay on Santorini. Its architectural features with their free forms and the sets of stairs, bridges, and cubist cottages combine ideally past with present. �All rooms are equipped with A/C, color satellite TV, CD player and radio, direct-dial phone, safe, mini bar, mini wine cellar, hairdryer, marble bathrooms, veranda with exquisite volcano view. Most suites also include an indoor Jacuzzi. �The hotel has two very large swimming pools, open-air Jacuzzi, massage, pool bar and pool restaurant "Krini", gourmet dinner restaurant "The Katikies", snack bar, library with internet facilities. It also offers a full set of guest services that include travel desk, room service, twice-daily maid service, laundry and ironing. Beautiful panoramic view from all common spaces. All rates shown below are daily, per room (NOT per person), expressed in Euros (�) and include breakfast and all hotel taxes unless otherwise indicated. Rates for self catering units (studios/apartments) and private pension rooms do not include breakfast.